BIC Pens: 4 Reasons Why They Make the Perfect Promotional Giveaways! This is a guest post written by Promo Direct, a promotional agency in the United States. Pens are very common but useful products as promotional giveaways. This article is trying to show the usefulness of even a basic plastic pen. One such example is the BIC pen. BIC pens have an illustrious history that dates back to the year 1945 when Marcel Bich and Edouard Buffard introduced fountain pens. For the past 68 years, BIC has grown from strength to strength, carving for itself an envious place in the world of pens. The past decade has witnessed an increase in demand for BIC pens as promotional giveaways. They have been sought by business owners for a variety of reasons: brand awareness, employee appreciation, customer retentions, causes and lots more! i. Brand Impact: BIC is a brand associated with quality and endurance. They are adorable to look at and smooth to write with. A household name, BIC has withstood the test of time and crowned as a market favorite for years. ii. Budget-friendliness: You can buy hundred of BIC pens for your marketing campaign and still have a lot to spare for other goodies! BIC pens may be inexpensive but they are high on quality, capable of giving you the visibility you deserve. iii. Variety: No other brand offers the kind of pen varieties BIC offers! 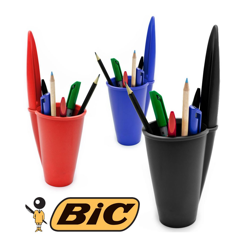 If you need click pens, you could go for the BIC® Clic Stic, the BIC® Tri-Stic or the BIC® Clic® Gold. Or if you think ballpoint pens make better giveaways, then the BIC® Pro+® is the product for you. iv. Color and style: BIC pens are stylish, colorful and destined to win hearts wherever they are used! Your recipients will love these pens and those around will notice them as well, giving your band THE quality visibility it deserves! v. Fun to personalize! : Visit a website and choose the BIC pen you wish to represent your brand. Share your artwork with the production team and review how good your logo and messaging looks on these pens. Order only if you are satisfied the pens complement your brand. You will have fun personalizing them! Head over to the promotional product experts to explore a wide collection of BIC pens! Promo Direct is a promotional products company that has been around for more than 20 years. Founded by Internet entrepreneur Dave Sarro, Promo Direct provides advertising and marketing solutions to a hundreds of business owners and institutions in the United States. With an inventory of more than five thousand products, the company has an answer for every marketing requirement under the sun. I had no idea that Bic Promotional Pens have been around since 1945. I guess I shouldn't be surprised, as I love the things. I had no idea that bic pens have been around since 1945. I guess I shouldn't be surprised, as I love the things. Getting brand recognition is vital for any business start up. Here plays the role of Promotional Pens products like Pens and pencils. They are the smartest way to attract your current & potential customers.More details visit 911pens.com.